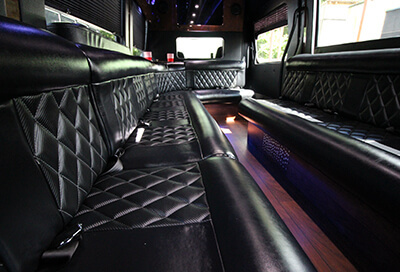 At Orlando Party Bus, we offer an extensive line of vehicles to choose from. Each vehicle has its own flair and depending on your group size, we know there is one that will fit your situation perfectly. Rest assured that they are all well maintained inside and out. We have certified mechanics who are continually keeping them in tip top running condition. Also, the amenities are second to none. You will be astounded at the quality of our fleet. The only thing you need to do is allow one of our friendly customer service agents to help you decide which one would be best for you and your event. So, take your time and peruse our assortment of vehicles below and get ready to talk to us about one that catches your eye. Our largest party bus selection is the most popular as well, but that isn't a surprise. That's because this amazing vehicle can fit all of your friends, making for the best party experience ever. 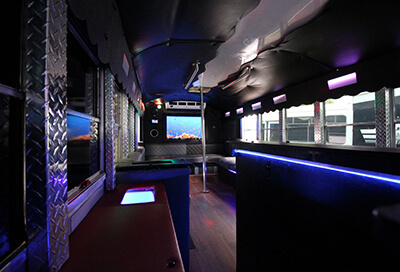 With all of the different amenities, you're sure to have a memorable experience on this great party bus! Use it for your bachelorette or bachelor party, wedding or bar hopping experience! One of our largest buses can hold 40 of your friends and/or family members. It's one of our popular sizes because of how large it is and how much room you're allowed. You can have your party last all night long with its long list of amenities. This bus can be used for weddings, nights out, bachelor or bachelorette parties, corporate events and more. 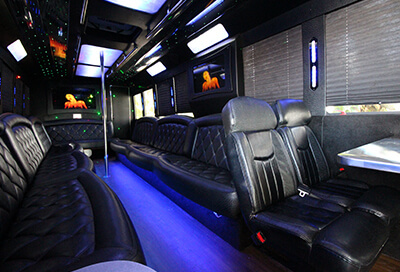 Our 34 Passenger Party Bus is a comfortable, deluxe mode of transportation for your next party experience in Orlando. 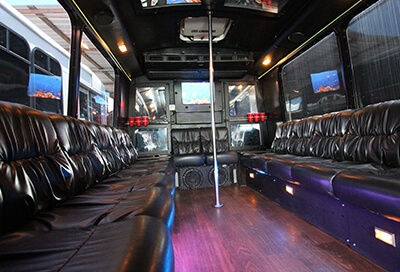 Perfect for bar hopping, school dances, birthday celebrations, and more, this party bus is sure to impress you and your friends. With features that are sure to get the party started, all you have to do is hop on board to begin your fantastic night out on the town. 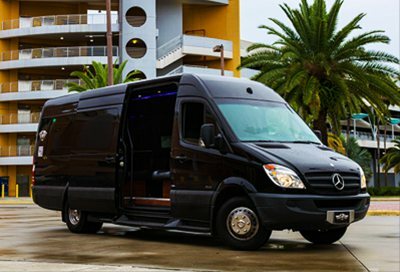 When it comes to party buses, this midsize option is one that you cannot go wrong with. With some of the best features in the business, this affordable option is one that you shouldn't pass up. The interior of this party bus looks more like a nightclub than a vehicle, so you're sure to have the party of your life on board this deluxe vehicle. 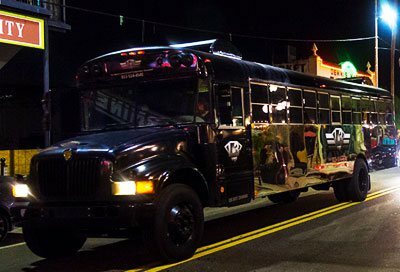 Dance, party, and drink the night away with all of your best friends on this bus. Looking for a midsize option, this is the most affordable on a per passenger basis that you shouldn't pass up. 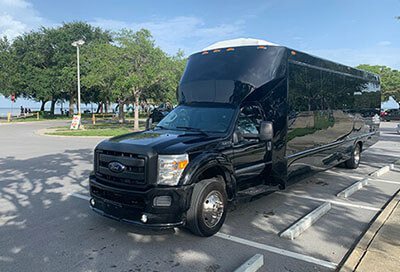 Our beautiful party bus is a rolling nightclub that you may choose to not even get off of, because you will have the party of your life on board this deluxe vehicle. 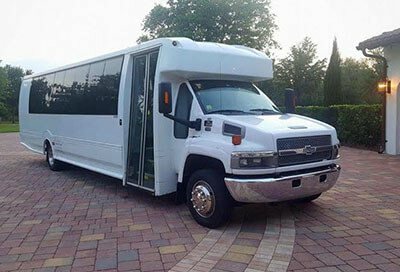 This bus is perfect for bachelor and bachelor parties, birthdays, proms, and any other major event worth celebrating in you life and we hope you have many. If you have a party of fewer than 20 guests this is the perfect vehicle for you. Complete with all of the same features as our largest buses, in a more cozy atmosphere. No need to yell over your music to talk to someone 12 feet away, in this bus you can hold a group conversation much easier than the other larger vehicles. This bus is beautiful inside and out, outside is decorated with graphics and sleek black paint. 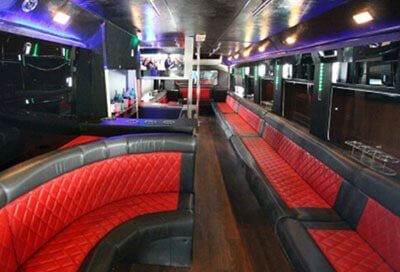 Our 15 Passenger Party Bus is a great option for those bar hopping nights in Orlando. 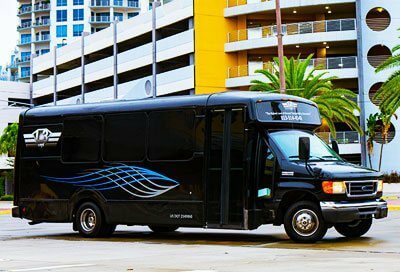 This is perfect for a group of friends looking for the best possible time in Orlando, as you'll be able to enjoy world class features as you roll through the streets turning heads in this party bus. You can't go wrong with this party bus for weddings, bachelor and bachelorette parties, night out on the town, or a birthday celebration! This 6 Passenger Cadillac Escalade is a great choice for groups looking to travel through Orlando. There's no better choice if you're looking to provide transportation for a small group! That's because this amazing Escalade has tons of legroom as well as space for storage. You can't go wrong using this for your next family get together or bar hopping experience in Orlando! Book it now, before someone else does. If it's classic transportation you're looking for, don't look any further than this 4 Passenger Lincoln Towncar. This brand is known for their ability to provide timeless transportation in high quality vehicles, and we'll make that experience even better for you by adding our knowledgeable and efficient professional chauffeurs. You're guaranteed to have a great time in this amazing Lincoln Towncar! Take a ride in our contemporary Chrysler 300, and you won't forget it! That's because this amazing vehicle is made with your comfort and mind, and with our professional chauffeurs, we'll take it to the next level. This vehicle is perfect for those airport pick up and drop off needs, and it's also great for tours of the city and weddings. Reserve our Chrysler 300 the next time you need luxurious transportation! This Avalon Hybrid is a green option to consider for your travels in Orlando. This is because it's a Hybrid, so you'll have less of an impact on the environment, making this a smart option no matter which way you look at it. There's nothing better than an affordable vehicle that doesn't leave you with a large carbon footprint. Give this vehicle a shot!